In the year 2135, There is a chance that an asteroid the size of the Empire State Building nicknamed BENNU will crash into Earth. Well, the probability of happening that is 1 in 17000, which is very low, But even so, the near-earth objects like asteroids and comets are a real threat. Barringer Crater in Arizona and Tunguska Event in Russia are believed to be the work of space rocks slamming into our planet. In fact, we avoid close calls from near-earth objects all the time. NASA's planetary defence coordination office is responsible for finding tracking and in extreme cases destroying them. 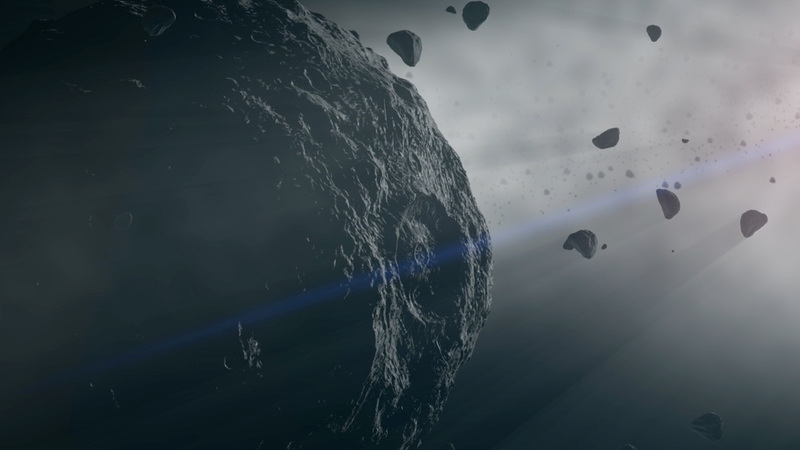 The planetary defence office deals largely with asteroids because there are millions of them left over from the formation of the solar system. They are typically composed of rock-forming minerals like Olivine and Pyroxene, but they can also contain Metal, Sulfides, Clays and Organic compounds. These space rocks range in size from hundreds of miles or kilometres to just a few feet across. Like the planets, asteroids revolve around the Sun in elliptical orbits. Most of them are found in the Asteroid Belt between Mars and Jupiter but because of there unstable orbits, some have been known to migrate towards Earth. Once an Asteroid comes within 28 million miles or 45 million kilometres of Earth's orbit the planetary defence office classifies it as an NEA or Near Earth Asteroid. There have been over 18,000 NEAs discovered in the last four decades. Large asteroids that are over 460 feet or 140 meters in diameter and on track to come within about 5 million miles or 8 million kilometres of Earth's orbit are classified as PHA Potentially Hazardous Asteroids and These are the space rocks we should be worried about like BENNU. This PHA, BENNU, is a huge focus of the planetary defence office as it passes through Earth's orbit every 6 years. It is about as wide as five football fields and weighs more than the Titanic. If it were to slam into earth its force would be 80,000 times more powerful than the nuclear bomb that destroyed Hiroshima. But don't panic like we said the chances of this happening are very small and a vast majority of any asteroids that enter Earth's atmosphere disintegrate before reaching the surface. But for fun let's say we do face an Armageddon scenario and BENNU who does head straight for Earth. What could NASA do to stop it? To deflect an asteroid and prevent impact scientists have to change the object's velocity by less than an inch per second years before the projected collision. NASA is investigating two potential ways of doing this. The First Method is a Gravity Tractor. A spacecraft would fly alongside the asteroid for an extended period of time, essentially using its own gravity to slowly pull the NEA away from Earth. But this could take years or even decades to pull off. The Second Method is a Kinetic Impactor, which involves one or more large high-speed spacecraft into the path of the approaching asteroid. Scientists have already designed a prototype and it's called Hypervelocity Asteroid Mitigation Mission For Emergency Response Vehicle in short HAMMER. The spacecraft would serve as either a Kinetic Impactor or as a transport Vehicle for a Nuclear device. If the incoming asteroid is detected early several HAMMER vehicle will be dispatch to collide with the massive rock each collision would help further deflect the asteroid off its path to Earth. If that doesn't work then scientist would turn to the nuclear option a HAMMER vehicle would transport a nuclear device near the asteroid and then would detonate the bomb. The force of the explosion would ideally break off a chunk of the space rock creating jet-like propulsion that would drive the asteroid away from our planet. But before we make any rash decisions about BENNU's fate NASA and the planetary defence office needs to learn more about this PHA and it's potential for impact. The spacecraft OSIRIS-REX is on route to BENNU, who .as we speak, collecting a sample of the asteroid. But we have to wait until 2023 to get more information on whether or not this massive Space Rock could really end civilization as we know it.